In this post, I explain how to Display Master/Detail Data from a Database using Microsoft Report (rdlc) in ASP.NET. Step-4: Create a Stored Procedure for fetch join data. Right Click on Stored Procedure (in your database) > Add new Stoted procedure > Write following SQL Code And Save/Execute. Chose your data connection > select your database > next > Select tables and Select Stored Procedure> enter Model Namespace > Finish. Step-6: Add a Dataset (this is required for our .rdlc file). Go to Solution Explorer > Right Click on Project name form Solution Explorer > Add > New item > Select Dataset under data> Enter dataset name > Add. Step-7: Add Report file(.rdlc) and Design your report. Right Click on Solution Explorer > Add > New item > Select Report under Reporing > Enter report file name > Add. 1. First add Our Created Dataset. Under report data Click on New > Dataset > Choose Data Source(existing created Dataset) > Select Available Dataset > OK.
2. Add a List Control to rdlc design page. Under Toolbox > Report Item > Drag List to Design Page. Select List Control > Open Properties > Select Dataset Name. 3. Add Row Group for this List Control of rdlc page. Select List Control > Under row group Click on Details > Group Properties > Click on Add (under general tab) > Select Group On > Ok.
4. Add Fields inside List Control for Show Master Data. 5. Add Table inside List Control for Show Details Data. 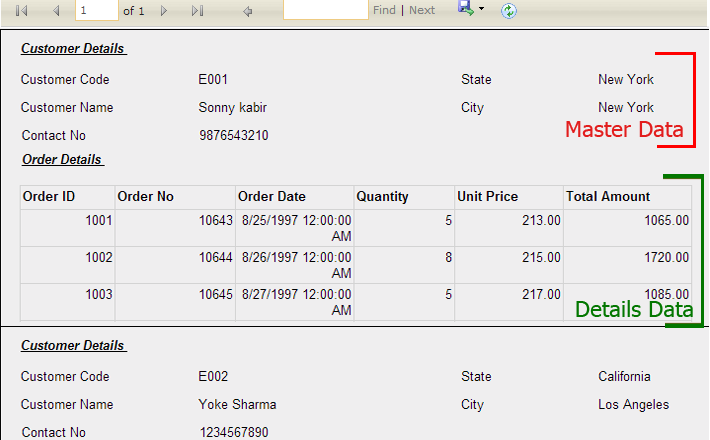 Step-8: Add a Webpage and Design for show Master Details Record using Report Viwer. Step-9: Write code in page_load event for fetch Master data from database and bind to report viwer.